WILLIAM WILLARD MOSES, agent for the United States Express Company at Decatur, Indiana, is a native of Carroll County, Ohio, born November 24, 1832, a son of John and Rebecca (Stattler) Moses, natives of Somerset County, Pennsylvania, of German parentage. They were married in 1824, and in 1832 moved to Carroll County, Ohio, where the father died in 1872, aged seventy-two years. The mother died near Decatur, Indiana, in 1868, aged sixty-eight years, while on a visit to her children. In politics John Moses was first a Whig, and then a Republican. He was for several years a justice of the peace. Both were members of the Lutheran church. W. W. Moses was reared in his native county, and when twenty years of age went to New Cumberland, Ohio, where he was employed in a mercantile establishment two years. In October, 1854, he came to Adams County, Indiana, and was employed as clerk for J.D. & J.M. Nuttman, of Decatur, until 1860, and in the fall of that year became associated with D. Crabbs, under the name of Crabbs & Moses, in the general mercantile business at Newville, Wells County. In the fall of 1863 they moved their business to Decatur and admitted B.J. Rice to the firm, changing the name to Crabbs, Moses & Rice. In 1870 he retired from the firm and became a member of the H.W. Shockley & Co. Manufacturing Company, which afterward became a stock company known as Shockley Wheel Company, from which he withdrew in 1874. He then engaged in the hardware business at Geneva, Indiana, until 1880, when he closed out his business and returned to Decatur, and was soon after appointed by the United States Express Company agent at Decatur. In politics Mr. Moses is a Republican. He has served one term as councilman of Decatur. November 4, 1862, he was married to Miss Julia Patterson, daughter of James and Eliza (Patterson) Patterson. They have four children - Louis C., a telegraph operator; Nettie, a teacher in the Decatur schools; Homer P., a clerk in the office with his father, and Warren W., still a student. Mr. and Mrs. Moses are members of the Presbyterian church. WILLIAM H. H. BRIGGS, carpenter, residing at Geneva, was born in Muskingum County, Ohio, October 5, 1836. His father, Andrew Briggs, was born in Maryland in 1786, and when seven years of age removed with his parents to Ohio, who settled in Muskingum County, where he was twice married. His first wife was Ellen Linn, who was born in Ohio and died in that State. She was the mother of two sons and two daughters. His second wife was Sarah Finley, a native of Ohio, where she died in 1845. She had four sons and four daughters. The father died in February, 1863, aged seventy-seven years. He was engaged in the mercantile trade at Rockville, Ohio, for several years, and afterward removed to Hancock County, where he followed farming until his death. His father was a soldier in the Revolutionary war, and also in the war of 1812. William H. was reared at home on the farm, and when nineteen years old went to learn the carpenter's trade, which he has since followed. He enlisted in the army September 5, 1864, and after sixty days was discharged for disability. He is a member of John P. Porter Post, No. 83, G. A. R. Mr. Briggs was married April 20, 1859, to Catherine Harmel, who was born in Columbiana County, Ohio, April 2, 1838, and they were the parents of five sons and one daughter. Mrs. Briggs died July 1, 1884. His second son is a minister of the Methodist Episcopal church, and is now in charge of the church at Fort Wayne. His children are - Andrew G., Albertus T., William, Ellen, Charles J. and John E.
REUBEN LORD, one of the pioneers of Adams County, was born in Cambridge, Franklin County, Vermont, July 15, 1807, son of Reuben and Mary (Devoll) Lord, the former a native of Boston. He came to Adams County in the fall of 1836, and settled in Root Township, entering eighty acres of land from the Government. He subsequently sold this place and bought his present homestead. He was married March 6, 1830, to Sabrina Benson, a native of New York State, born December 25, 1812. They had a family of eleven children children - Harriet, Martha, Fidelia (deceased), Martin, Franklin, Otis C. (deceased), Phidelia, William Henry, Mary, Matilda and Elmira. Mrs. Lord died, and Mr. Lord was married November 26, 1869, to Mrs. Ruth (Mickle ) Chenoweth, daughter of Reuben and Mary (Martin) Mickle, and widow of John P. Chenoweth. They have one child - Cora C. To the first marriage of Mrs. Lord were born four children - Thomas W., Reuben, John P. and Rachel A.
JAMES ROBISON, deceased, was born in Champaign County, Ohio, January 5, 1810. He was reared in his native county, and after his marriage came to Adams County, Indiana, arriving here February 28, 1843. He entered eighty acres of Government land, and, with the help of his wife, built a shanty, in which they lived six weeks until a hewed-log house had been built. They kept bravely at work in spite of many hardships and trials, and to their first purchase added until at the death of Mr. Robison they owned 320 acres of valuable land. Mr. Robison was married in Delaware County, Indiana, his wife being a native of Champaign County, Ohio, born in 1818, her father moving to Indiana a short time before her marriage. Mr. and Mrs. Robison had a family of six children - Frances, wife of William McCampbell; Maria; Perry; Jane, died aged twenty-two years; Mary, wife of W. Lewton, and Oliver, who died aged three years. JAMES C. PATTERSON, deputy postmaster at Decatur, is the youngest of the six children of James Patterson, who came to Adams County in 1839, and was born at Decatur, September 19, 1855. He lived at home until eighteen years of age, and was educated in the public schools of that place. He then learned telegraphy, and was employed as agent and operator by the Grand Rapids & Indiana Railroad Company from 1873 to 1881. For the next three years he was bookkeeper and assistant cashier in the Adams County Bank. He was elected city clerk in May, 1885, and appointed deputy postmaster by Norval Blackburn in July, 1885, both of which positions he now holds. He was also elected a director in the Eagle Manufacturing Company in 1886. He was married February 26, 1880, to Miss Lida Irwin, at Winchester, Indiana. Their two children are named Fred I. And Dora Marie. Mr. Patterson is a Democrat, and a member of the Knights of Pythias. GEORGE W. MENEFEE, an active and enterprising farmer of Wabash Township, residing on section 10, was born in Loudoun County, Virginia, in the year 1824. His parents were also native of Loudoun County, and later moved to what is now Monongalia County, West Virginia, where they spent the remainder of their lives, the father dying in 1861, aged seventy-four years, and the mother dying in 1876. George W., our subject, grew to manhood in Virginia, being reared on a farm and educated in the district schools. He was united in marriage in Virginia, February 22, 1849, to Miss Margaret Stoops, who was born in Greene County, Pennsylvania, November 9, 1833, a daughter of James Stoops, Sr., who came to Adams County, Indiana, in 1852. To Mr. and Mrs. Menefee have been born eleven children, of whom six still survive - Mary E., Nancy F., Edgar P., Virginia, Carrie L. and David C. Mr. Menefee came to Adams County, Indiana, in 1852, settling in Wabash Township, where he has since devoted his attention to his farm, and is classed among the old and respected pioneers of the county. ZACHARIAH SMITH, deceased, was a native of Fayette County, Ohio, born in 1809, a son of Isaac Smith. His parents were natives of Virginia, of German and Irish parentage, and in an early day settled in Ohio, where by honest and industrious efforts they secured a considerable amount of real estate, owning at one time, in Ohio and Indiana, 2,500 acres. Zachariah Smith was reared in his native county, and in 1832 was married to Susanna McClellan, a native of Pennsylvania, born in 1812. They lived in Ohio about three years after their marriage, and in 1835 moved to Adams County, Indiana, and settled in St. Mary's Township. 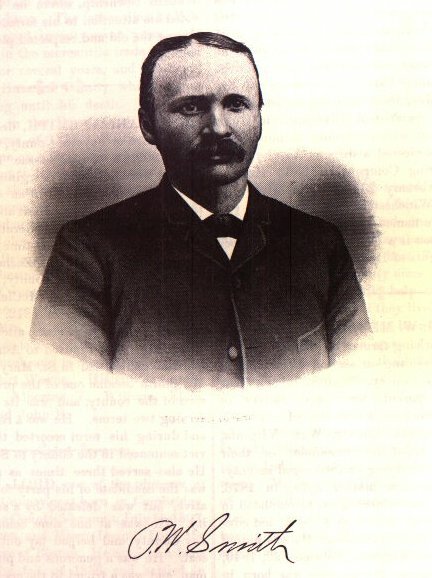 Mr. Smith became one of the prominent citizens of the county, and was it's first sheriff, serving two terms. He was a reliable officer, and during his term escorted the first convict sentenced in the county to States' prison. He also served three times as assessor, and was the candidate of his party for Representative, but was degeated by a small majority. He was at one time commissioner of Jay County, and helped lay out the county seat. He was a generous and public-spirited man, and was a friend to the needy. He was drowned in the St. Mary's River, July 7, 1844, while endeavoring to cross to procure a gift for a sick person. He left a family of nine children - Nancy, Mary, Martha, Catherine, Sarah, John, Jane, Isaac and Joseph W. John died, aged ten years, and the rest are living. The wife was thus left with a large family to care for, but she went bravely to work and succeeded well, as is attested by the esteem in which they are held in the county. She is an earnest member of the Methodist Episcopal church. PHILIP WESLEY SMITH, a member of the Adams County Lumber Company, at Decatur, Indiana, was born in Tuscarawas County, Ohio, near Massilon in 1851. His parents, Henry and Catherine (Leppla) Smith, were natives of Bavaria, Germany, where they were married, and in 1834 they came to the United States and settled in Ohio. In 1854 they removed to Whitley County, Indiana, and located near the line of Allen County, where the father died in September, 1885, at the age of nearly eighty-five years. The mother is still living at Churubusco, Whitley County. They were the parents of eight children, two of whom died in infancy. Philip W. Smith was reared in Whitley County, and was given the benefits of the common schools. He remained with his parents until his majority, and then was variously employed for two years, when he became associated with Jacob Colter, and engaged in lumbering at Arcola, Indiana, under the firm name of Colter & Co. They manufactured lumber in Arcola eight years, and then enlarged their field of operations, and now have five mills, three in Allen County and two in Adams County. Their mill at Decatur is conducted under the name of the Adams County Lumber Company, Mr. Smith having charge of the business at that place, as well as Monmouth and Williams mills. They carry on an extensive business, their sales being mostly to the railroad companies. Mr. Smith is a practical business man, and thus far through life has been a successful one. In addition to his large lumber interests he is the vice-president of the Decatur National Bank, in which he has a large interest. He is an honorable, upright man, and a worthy member of the Christian church, of which he is a liberal supporter. He is a member of the Odd Fellows order, Harmony Lodge, No. 19, and Harmony Encampment, No. 12, at Fort Wayne. Mr. Smith was married October 30, 1883, at Decatur, to Miss Katie Beery, a native of Adams County, a daughter of Abraham J. and Betsey (Welty) Beery, pioneers of this county. They have two children - Erman Clyde and Florence Irene. Mr. Smith is one of the hearty supporters of all enterprises of Decatur, such as the building of churches and improvements of all kinds that have a tendency for the good of mankind generally. JAMES PATTERSON was one of the pioneers of Adams County. He was born in Westmoreland County, Pennsylvania, April 16, 1810. In 1817 he emigrated with his parents to Wayne County, Ohio. When he arrived at the age of twenty-seven he was united in marriage with Miss Eliza Peterson, and shortly after he removed to St. Mary's, Ohio. In the spring of 1839 he came to reside in the newly laid out town of Decatur, where he continued to live until his death, which occurred November 13, 1875. He became a member of the Presbyterian church of Decatur in the winter of 1845, under the ministry of Rev. J.H. Nevius. Shortly after he became a member he was elected and ordained deacon, which office he held until death. He was next to the oldest of a family of six brothers and two sisters, and was the first one of the brothers called away. Of the remaining brothers, Alexander, William, Samuel, Robert and Thomas, only Samuel is now living. James Patterson left a wife and six children. WILLIAM G. GLANCY, farmer, residing on section 11, Wabash Township, was born in Licking County, Ohio, April 10, 1831, a son of Owen Glancy, an old settler of Adams County. Our subject was fourteen years old when he came with his parents to Adams County, and here he grew to manhood, remaining at home till attaining the age of twenty-three years, when he engaged in buying stock. He was married May 31, 1855, to Miss Taphinin P. Tindall, who was born in Crawford County, Ohio, October 7, 1836. Her parents, William and Lydia (Dony) Tindall, came from Crawford County, Pennsylvania to Ohio in an early day. Their home in in Van Wert County, Ohio, though at the present time they are in Adams County, Indiana. They are of German descent. Five children were born to them, one son and four daughters. The mother is a member of the United Brethren church. Mr. and Mrs. Glancy have had four children - John A., born March 28, 1856, died September, 1868; Lydia Alice, born May 8, 1858, is the wife of Rev. Isaac Teeters; William, born June 17, 1863, died January 29, 1864, and Viola, born April 1, 1876, died April 20, 1877. Mr. Glancy has been engaged in farming since his marriage. In the spring of 1868 he removed to the farm which is still occupied by himself and family, his farm consisting of thirty-five acres of choice land. In politics Mr. Glancy is a Republican, and since coming to Wabash Township has held several local offices. Owen Glancy, the father of our subject, was born in Allegheny County, Pennsylvania, September 9, 1808, a son of James Glancy, a native of Ireland. He came to America when a young man, locating in Pennsylvania, where he was married, his wife being a native of Germany. They subsequently removed to Knox County, Ohio, where they lived till their death. Owen Glancy grew to manhood in Knox County, and his father being a farmer he was reared to the same avocation. He was married in 1829 to Miss Sarah Green, a native of Knox County, and a daughter of William and Sarah Green, who were natives of Scotland, immigrating to America and settling in Knox County, where they lived till their death. Mr. Glancy was subsequently married to Mirs. Elizabeth Aspey, and was a third time married to Mrs. Rebecca Brown. He was the father of twelve children. In early life he learned the cooper's trade, which he followed till he came to Adams County, Indiana, November 1, 1846. He then entered eighty acres of land in Monroe Township, where he lived until 1863. He then sold his land in Monroe Township and removed to his farm on section 23, Wabash Township. He died at Decatur February 22, 1884. He was a member of the Disciple church, and the mother of our subject was a member of the Methodist Episcopal church. WESLEY I. B. WASS, farmer, section 5, Union Township, came to this county in March, 1865, and purchased the farm entered by William P. Rice. He was accompanied by his wife and two children. Mr. Wass was born in Carroll County, Ohio, March 18, 1837. He grew to manhood in his native county, his education being limited to the common schools of his father's district. His father, Samuel Wass, was born in Derbyshire, England, in 1790. He was reared and married in England, and in 1818 came to America with wife and two children, settling in Pittsburg, Pennsylvania. They lived there a short time, then removed to Stark County, Ohio, thence to Carroll County, where the father entered land from the Government. He was a wheelwright by trade, and also rode the Methodist circuit for many years. The parents come to this county with their son Wesley, and the farm was purchased by both. They lived here until the mother's death, then the father went to live with other members of the family. He died in 1876, lamented by all who knew him. The mother, Phebe (Ward) Wass, was born in Devonshire, England, in 1792, and died in Decatur, this county. Both are buried in the Monroeville cemetery. The mother was the first school-teacher in Carroll County, Ohio, and organized the first Sunday-school in Brown Township. She taught school free of charge, from purely philanthropic motives. Our subject was married May 2, 1861, to Miss Elizabeth D. Pottorf, who was born in Carroll County, Ohio, in 1842, where she was reared and married. Her parents were Jacob S. and Hannah (Gillmore) Pottorf, the father born in Pennsylvania, and the latter in Ohio; they are not living in Carroll County. Mrs. Wass died March 6, 1875, aged about thirty-four years, and is buried Union Bethel cemetery. There were eight children in the family - Luella A., born February 26, 1862, wife of R. K. Erwin; Lucy L., born March 30, 1863, became the wife of John A. Barkley; Emory D., born April 12, 1866; Mary O., born November 24, 1868; Alice s., born May 1, 1871; Charles, born March 2, 1875. Mr. Wass married for a second wife Caroline Wagner, who was born in Germany, and came to America with her parents, who settled in Ohio. She died July 12 1881, leaving two children - Daisy D. and Maude E. Politically Mr. Wass is a Republican, and has served as township trustee. His paternal grandparents died in England. The grandfather of his wife, Andrew Pottorf, was of German descent, and died in Carroll County, Ohio. EBENEZER ROEBUCK, an active and enterprising citizen of Pleasant Mills, was born in St. Mary's Township, Adams County, Indiana, a son of Abner and Margaret (Brisbon) Roebuck, natives of Ohio, the father born in Fayette County, October 23, 1813, and the mother in 1817. They immigrated to St. Mary's Township in 1839, where the father purchased eighty acres, which they began to clear and improve. Before much progress had been made, however, the mother became violently ill with milk sickness, in consequence of which they removed to a more healthy locality, settling on a farm near Pleasant Mills. They subsequently moved to Ohio, but soon afterward returned to Indiana. The father enlisted in an Ohio regiment in 1864, serving his country until the close of the war, when the received an honorable discharge. After the war he moved to Michigan, locating in Kalamazoo County, where he purchased forty acres of land. He finally settled in Kent County, where he died November 25, 1885. He was an earnest and worthy member of the Methodist Episcopal church until his death. His widow still survives, and is living on the homestead in Kent County, Michigan. She is an active Christian lady, and is a member of the Protestant Methodist denomination. Ebenezer Roebuck, whose name heads this sketch, was a brave and gallant soldier during the war of the Rebellion. He enlisted September 21, 1861, in Company A, Twenty-first Ohio Infantry, and was mustered into the service at Camp Lyon, Worthington, Ohio, when he was immediately ordered to the front. In the spring of 1862, on arriving at Cincinnati, he was ordered to Paducah, Kentucky, and was there detailed as teamster. His regiment participated in the battle of Shiloh, where it lost heavily, this being one of the first regiments fired on by the Confederates. From there the regiment was ordered to Corinth, where it was joined by our subject, and took part in a two weeks' skirmish. Mr. Roebuck then went with his regiment to Moscow, Tennessee, where almost all of his company were taken prisoners. This capture was accomplished by a very cowardly device. The rebels had brought into the Federal camp prisoners for parole, and on their return had captured the Federal pickets, including the Captain of Company A. They were, however, soon paroled and joined their company. The regiment went to Memphis, Tennessee, where Mr. Roebuck was detailed as teamster, a duty he performed about three months, when he again joined his regiment and started for Vicksburg, Mississippi. Their supplies were cut off at Hollow Springs, which forced them to return to LaGrange, Tennessee. From Tennessee the regiment went to Vicksburg by water, where Mr. Roebuck took part in that hard-fought battle. The regiment then proceeded to Jackson, Mississippi, taking part in that hotly contested battle. Mr. Roebuck was here detailed to drive a division train while his regiment returned to Memphis. Our subject subsequently went to Chattanooga, and all along the march took part in engagements and skirmishes. He participated with his regiment in the engagements at Kenesaw Mountain, Pigeon Roost and Missionary Ridge. In the advance at Missionary Ridge Mr. Roebuck was badly injured, having been run over by a heavily loaded wagon drawn by six mules, on account of which he was sent back to Bridgeport, thence to Nashville, which place he left and joined the wagon train at Bridgeport. He was then appointed wagon master, and served faithfully in this position almost a year. From Bridgeport he went to Scottsborough, where the regiment veteranized, then returned home on a thirty days' furlough. During the absence of his regiment Mr. Roebuck went to Tennessee and was engaged in the battle of Pigeon Roost, where the Union forces suffered defeat. He then returned to Bridgeport with the wagon train which he had in charge. In the spring of 1864 he participated in the Atlanta campaign, fighting along the march, and was engaged in the two days' fight at Atlanta, the 22d and 28th of July. He was also at the engagement at Eastport, which was the last battle seen by him, and here he had the satisfaction of seeing the rebels retreat after making a desperate and persistent charge, the huzzas of Union soldiers on this occasion drowning the din of cannon and musketry. Shortly after this battle Mr. Roebuck was mustered out of the service, receiving an honorable discharge September 20, 1864. Upon his discharge paper is the endorsement of the time he was mustered for final pay dated September 28, 1864, and signed by W. G. Tanell, paymaster, United States Army. After the war Mr. Roebuck returned to St. Mary's Township, Adams County, and June 21, 1865, he was married to Lucinda Catherine Ellis, a daughter of William and Phoebe (McDorman) Ellis, who were pioneers of Ohio. Mrs. Roebuck was left an orphan when only five years of age. Her father was shot and robbed while passing through a field, on his way to make the final payment on a piece of land he had purchased, and his body was not found for several days. He was the father of three children - Lucinda Catherine, Juda and a son who died in infancy. Juda married Thomas Hudson, of St. Mary's Township, and died in 1872, leaving three children - Andrew, Albert and Cally. Eight children have been born to Mr. and Mrs. Roebuck - Stephen, born March 25, 1866; Albert A., July 17, 1867; Grant, May 9, 1869; Oscar, April 28, 1871; Flora B., September 6, 1873; Perry, December 6, 1875; Edda, born August 16, 1878, died July 26, 1881, and Eda, born July 16, 1880. Mr. and Mrs. Roebuck lived at St. Mary's, Ohio, after their marriage until 1867, when they came to St. Mary's Township, Adams County, Indiana, and settled in the village of Pleasant Mills, where Ebenezer engaged in the lumber business and operating a saw-mill at the same place. He is a member of Sam Henry Post, No. 83, G. A. R., at Decatur. Mrs. Roebuck is an earnest member of the Baptist church. JOSEPH MILLER, deceased, was one of the pioneers of Adams County, and for nearly forty years a prominent citizen. He was born in France, in 1818, a son of Christian and Elizabeth Miller, natives of Germany. When he was ten years old his parents came to America, and first settled in Wayne County, Ohio, where they lived until 1840, when they came to Indiana, and located in Union Township, Adams County, where they passed the remainder of their lives. He was reared in Ohio, and was there married to Anna Miller, a native of Germany, born in 1819, and although of the same name, not a relative. To them were born eight children, five of whom are living. Mr. Miller died October 10, 1879, and his widow still lives on the homestead in Union Township. In politics he was a Democrat. COVEY GALLAWAY, deceased, who was one of the pioneers of Adams County, was born in Bracken County, Kentucky, in 1801, his parents being natives of the same State. His father being a farmer he was reared to the same avocation, which he followed through life. He grew to manhood in his native State, and subsequently went to Urbana, Champaign County, Ohio, where he married Matilda Hurst, who was also a native of Kentucky. To this union were born eight children, four sons and four daughters. They came to Indiana in the spring of 1840, and settled on section 1, Wabash Township, Adams County, where the father entered 160 acres of land, residing on this farm till his death, which occurred January 18, 1875, aged seventy-four years and three months. The mother died December 3, 1854, aged forty-five years and eleven months. The father was a thorough, practical farmer, and by his industry and good management he was enabled to add to his original purchase until he owned at one time 360 acres. He was an enterprising and public-spirited citizen, and always took an active interest in the advancement of his township or county. When he first came to Adams County he was obliged to go to Fort Wayne, Allen County, to mill. Samuel Gallaway, the seventh child of Covey and Matilda Gallaway, was born on the homestead in Wabash Township, Adams County, the date of his birth being August 18, 1847. He grew to manhood on the home farm, remaining with his father till he became of age, and in his youth received the benefits of a common-school education. In 1870 he went to McLean County, Illinois, where he work on a farm two years. He then returned to Adams County, and a year later, September 25, 1873, he was married to Miss Mary E. Menefee, who was born in St. Mary's Township, Adams County, December 15, 1852, a daughter of George W. Menefee, an early settler of Adams County. To Mr. and Mrs. Gallaway have been born two children - Jennie C., born April 2, 1881, died July 28, 1882, and Norval B., born June 15, 1884. On leaving McLean County, Illinois, Mr. Gallaway returned to Adams County, and engaged in saw-milling, which he followed four fourteen years, when in 1885 he removed to his present farm, and has since been engaged in farming, in which he is meeting with good success, and is classed among the respected men of Wabash Township.